There are so many shades of orange that could be used to accentuate the fall theme of your wedding, and today’s cake does it in a subtle not-over-the-top way. 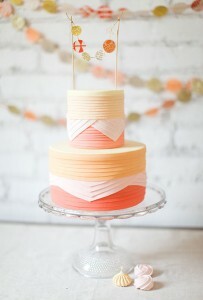 The two-tier cakes features a darker orange icing accented by white and lighter orange. The design on the icing adds some depth the cake and the cake topper is fun and adds some whimsy! This cake would also be lovely with smaller fresh flower – or you could add some Halloween fun to it if you’re reception happens to have a spooky theme. You really can’t go wrong with an orange cake at this time of year. You can find this pretty orange cake here. It was created by Lael Cakes.